So for dinner, this evening this is what i cooked: Brussels Sprouts. 1 bag of brussels sprouts of about 16 oz. First you will want to cook the bacon. Cut the bacon strips in tiny strips and turn the stove to medium-high. Cook the bacon until it is crisp. Drain the bacon drippings from the bacon using a colander and place the bacon into a small bowl. If you are using bacon strips, just warm them up in a frying pan with 1 tsp of olive oil. Empty the bacon into a small bowl and Set aside. Now, rinse the brussels sprouts in water with a little bit of vinegar. Remove the outer leaves of the brussels sprouts if they are damaged. Cut the brussels sprouts in half. Place them in the large round mold, and add 2 tbsp of the cooked bacon. Cover the large round mold with the octogonal silpat and microwave for 4-5 minutes. 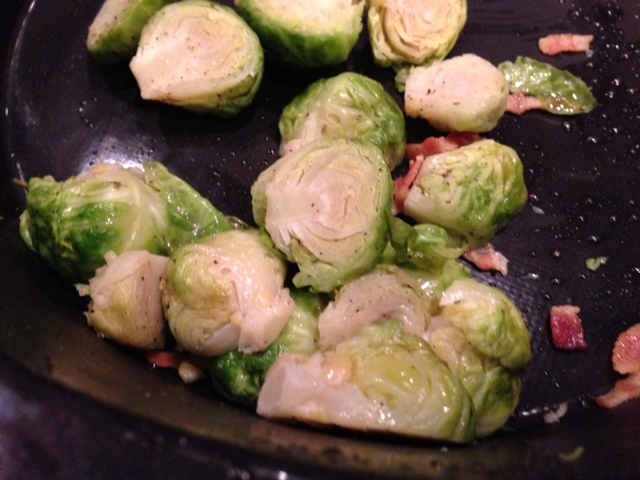 The brussels sprouts should be cooked but still firm ( I don’t like them too soft). 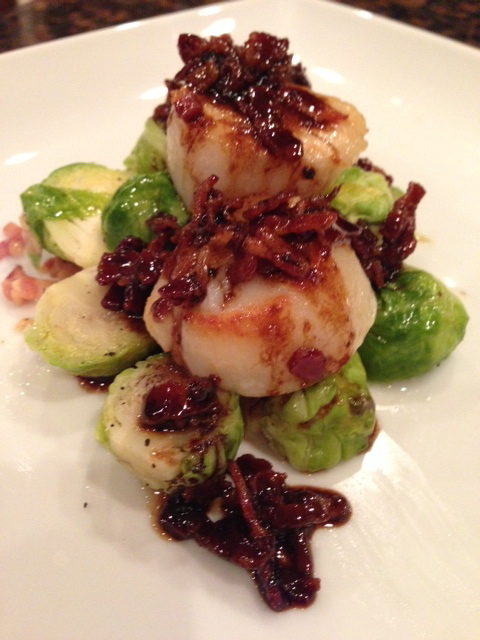 While the brussels sprouts are cooking, turn the heat back under the saucepan and when the pan is hot, add the scallops. Saute them for a minute on each side or until they are golden. 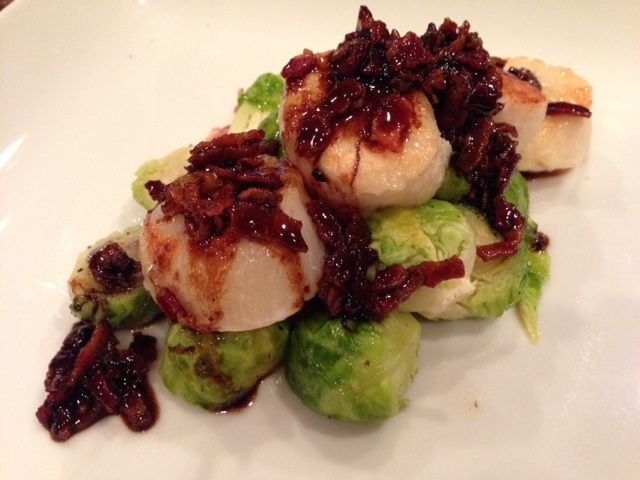 Spoon the brussels sprouts on individual plates, and place the scallops over the brussels sprouts. Then pour 1/4 cup of Mediterranean balsamic vinegar into the saucepan with the rest of the bacon and bring this to boil. Season with salt and pepper, stir and remove the pan from the stove. Pour the thickened vinegar atop the scallops and eat up. Et voila!! I hope everyone had a fabulous Thanksgiving. I sure did even though I spent a lof of my day in my kitchen. But then again, it makes me happy. Unlike many of you, I did not host the Thanksgiving dinner. My sister-in-law did. As the only true-born American in our family of immigrants, she always has the honor to host Thanksgiving dinner. And the rest of us, get to help her out by bringing dishes. I was in charge of appetizers and desserts. 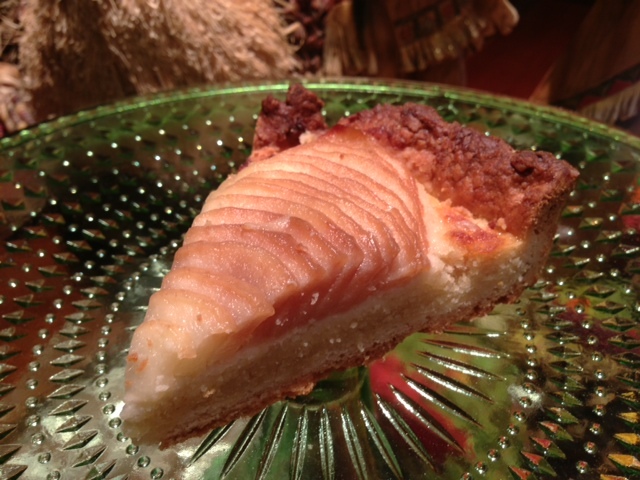 And for desserts, I brought a caramel cheesecake and a pear tart. I wanted to bring a chocolate something, but one of the guest brought 2 chocolate desserts, so i decided on the two desserts mentioned above. 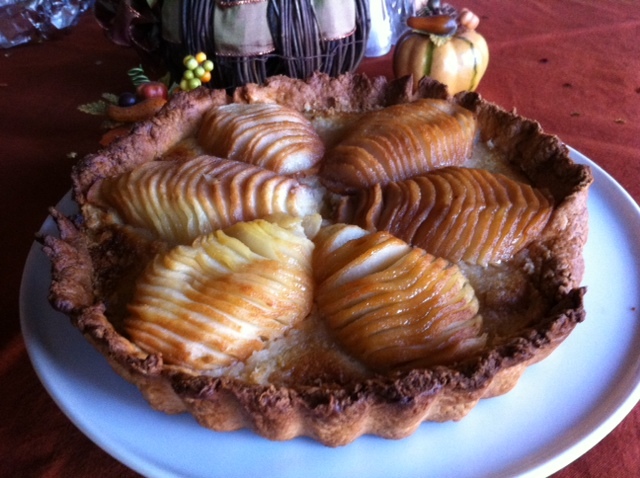 Today i will share the pear tart. It is really easy to make. And it is so yummy. You can buy an already pie crust in the refrigerated part of your grocery store, or you can make your own. The pie crust recipe is so much better than the store-bought. It is firmer so it will not break when you are trying to transfer the pie from the mold to a tray, and it tastes so much better than a store-bought. 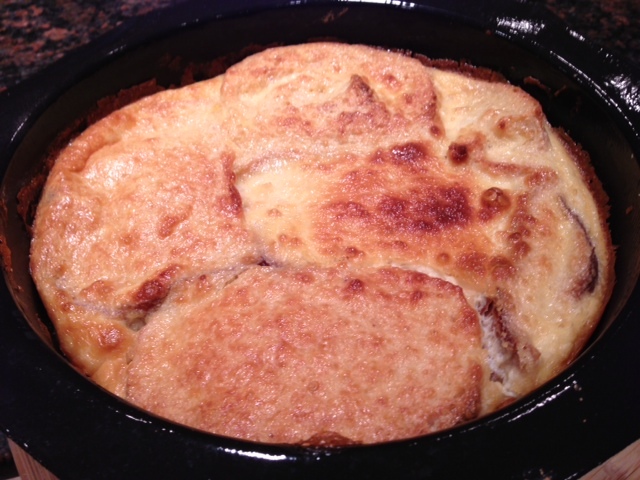 Sift the flour and the baking powder in a large bowl, then add the sugar and mix well. Add the butter cut into small pieces and mix in it in the flour with your hands, rubbing your hands together. Little by little add a few drops of water and knead the dough. Roll the dough in a ball and refrigerate for 15 minutes or more. Take the dough out of the refrigerator and place it on the roul’pat, and roll the dough out into a 10 inch circle. With the rolling-pin, lift the dough from the roul’pat and place it into the scalloped tart mold. With the fork, prick the pastry shell with a fork. 3 pears ( bosc preferably or red) peeled. First you will want to poach the pears. 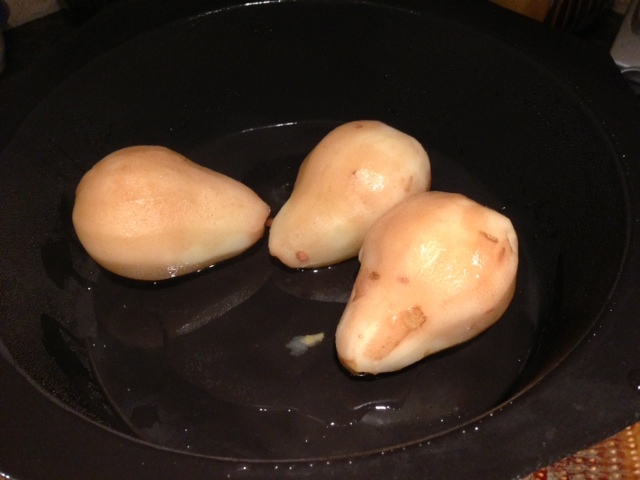 If you want to poach the pear the traditional way, you will need to poach the pear in a syrup of . I did not do that, instead I used my round mold. So if you want to save time, do the same. PLace the pears in the large round mold, add 1 tsp of sugar, 1 tsp of vanilla extract and cover the mold with the octogonal silpat. Cook the pear in the microwave for 5 minutes. Meanwhile, prepare the frangipane paste. In a bowl, beat the butter and the sugar until it becomes light and fluffy. Then add the almond mill and the flour and mix well. Add the eggs, 1 tsp of almond extract and mix well. Spread this mixture inside the pie. Then slice each pear in half. 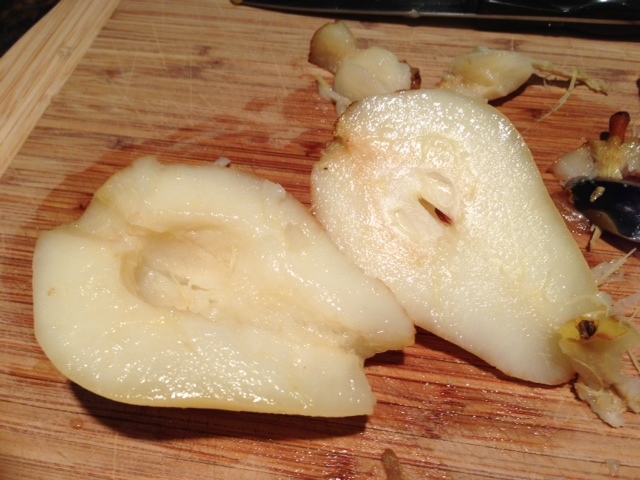 Scoop the seeds with a small spoon and slice the pear very thinly in tiny slices. 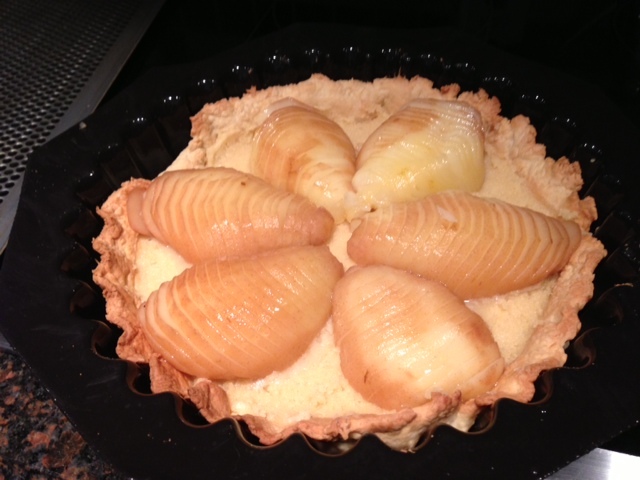 Place the pears on the frangipane paste as shown below. 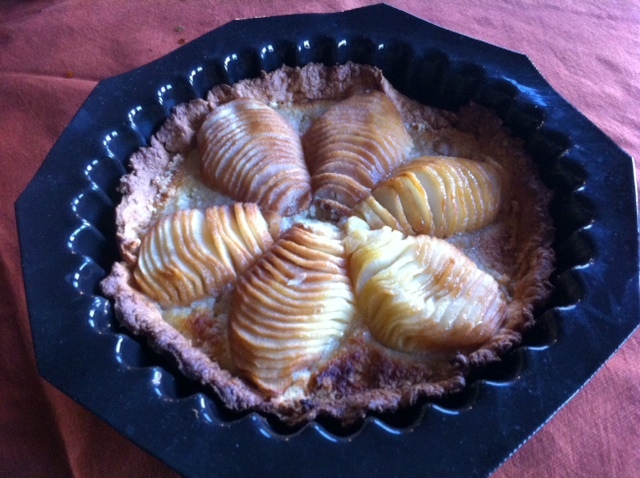 Cook the pear tart for 30 minutes at 375 or until the pie is golden brown and fluffy. This pie is wonderful warm, or cold. What did you guys eat this evening? left-over turkey, and left-over food from Thanksgiving? I was not that lucky to have left-overs as I did not host Thanksgiving, and all I brought was eaten. 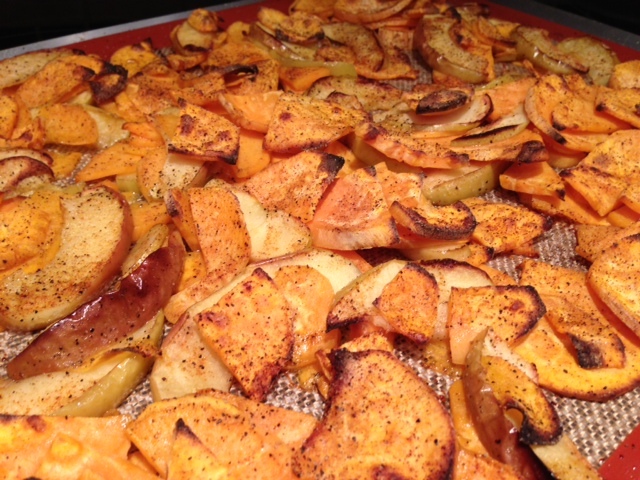 Place the cubed butternut squash, and sweet potato in the large round mold. Cover the round mold with the octogonal silpat and cook for 5 minutes. Meanwhile in a medium-sized pot, warm up 2 tbsp of olive oil. When the olive oil is warm, add the chopped red onion and saute it. Stir and cook the onion on medium-high for about 5 minutes, or until the onion is a golden brown and is soft. Add the steamed vegetables and saute them as well. Warm up the broth and pour it over the vegetables. Bring this mixture to boil and when it has come to boil, lower the temperature to medium. Cook the soup for 15-20 minutes or until the vegetables are soft. With an immersion blender, puree the soup. Add the coconut milk and the wasabi and stir well. I added 2 tbsp of wasabi paste, but you may want to use less. This soup was such a treat. I loved it, i hope that you will like it as well. I am a cold nature. I easily get cold, and when I do, it takes me for ever to regain my warmth. I have to put several layers, and socks over socks. I am the laughing stock of my family when i do… What is so strange is that it does not even have to be really cold outside for me to be cold so I have to have several sweaters on hand just in case. My husband makes fun of me because he says that i would never survive living back in France as their winter are usually more frigid than here…I really can’t disagree though I would probably readjust. When you are cold, there is nothing more recomforting than drinking a warm soup at any time of the day. 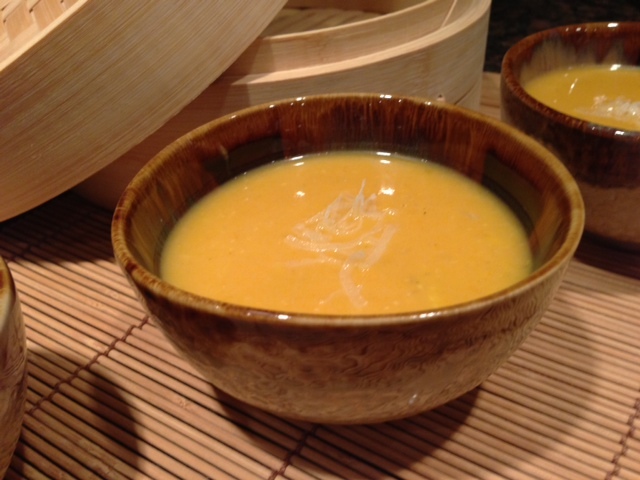 With the cool temperature coming up, soup is great for lunch or even for appetizers before dinner. 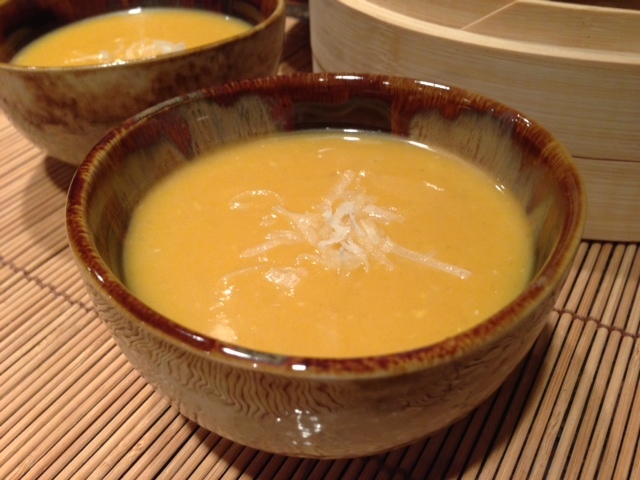 Last week I felt like eating a pumpkin and apple soup, but since I did not have any pumpkin on hands, I subsituted pumpkin with sweet potato. I really loved it. 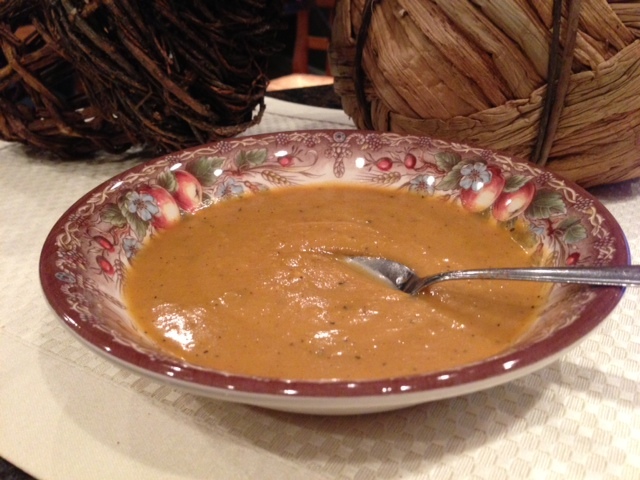 It is a bit different, but it was a nice change to the pumpkin or butternut squash soup that I often make in the fall. Turn the oven to 450. Place a large silpat on a large perforated sheet and set aside. Place all the sliced vegetables and fruit and large bowl and drizzle 2 tbsp of olive oil over them. With a spatula mix well so that the vegetables will be well coated with the olive oil. Spread the vegetables/ fruits over the silpat. Sprinkle some turbinado brown sugar, salt, pepper, cayenne pepper over the vegetables/ fruits and cook for 10-12 minutes or until the vegetables are cooked and are a bit roasted. Empty them into a large pot, add 6 cups of vegetable stock and cook for 15 minutes to 30 minutes. With an immersion blender, puree the soup. Add 2 cups of milk ( skim, whole, almond…whichever), stir and enjoy! 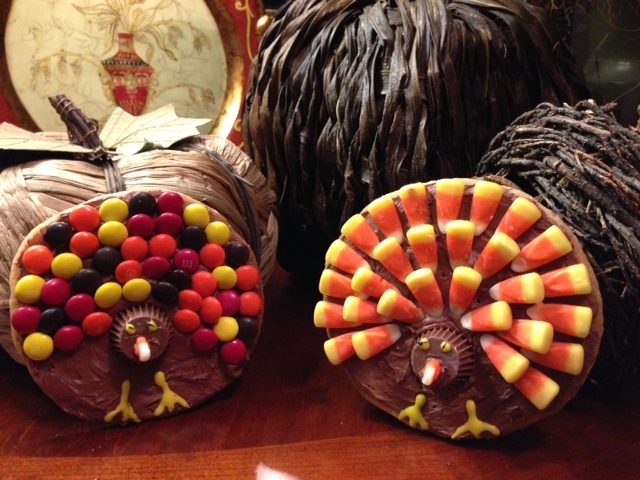 Fun Turkey Cookies for the Upcoming Holidays. This past week-end I gave a cooking class to a group of 11 girls aged 11, 12. Since it was for a birthday party and the birthday girl wishes to become a pastry chef, I thought of making all kinds of fun snacks, cookies and pastries with Thanksgiving as the common theme. On the menu, we made “pig”lgrim hat, a turkey out of cheese and fruit, cupcakes with turkey tops and finally corn husks out of sugar cookies. They had fun. They did find the class a bit challenging but they thoroughly enjoyed it. I hope that they will be able to duplicate those recipes at home. The recipe I am presenting you today is nothing that I am used to send you as it is using pre-made and bought ingredients, and the recipe is not that healthy, but I thought I would share it as you may enjoy to make theses with your loved ones during the Thanksgiving Holidays. 1 pack of M&M ( peanuts, or regular) as long as you are only using red, orange, yellow and brown colored ones. 1 box of chocolate whipped frosting. Turn the oven to 325. Place a large silpat on a large perforated sheet and set aside. Open the tube of sugar cookie dough and cut 12 slices that you will place at 1-2 inches interval on the silpat. Cook the cookies for 10-12 minutes or until the rim of the cookies are a nice golden color and the center of the cookies is still white. When the cookies are cooked, remove them from the oven, and let them cool completely before decorating ( it will take at least 1 hour). 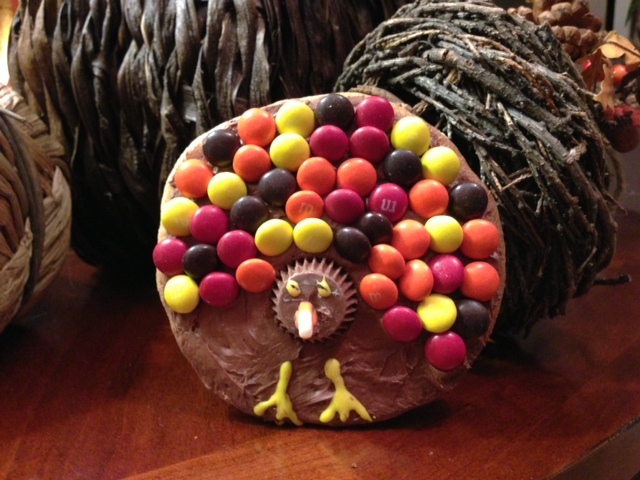 With a spatula, spread the frosting all over the cookie and decide which one you want to make ( M&M, or candy corn). 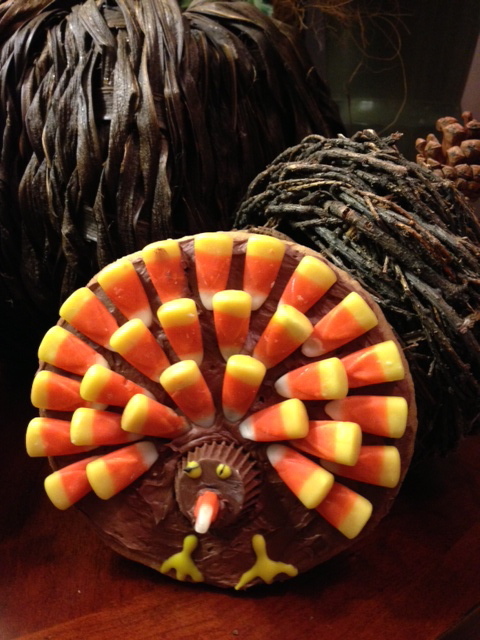 Start placing the candy corn, or M&M alond the edge of the cookie almost all around. Then start a second row, and a third as shown below. Place a Reese cup in the middle. With a knife, cut the tip of a candy corn and glue it on the Reese cup with a bit of frosting. Use the yellow icing to make the eyes and the feet, and the black to make the pupils. Repeat this with all the cookies. You may eat them as you finish them, or later on. They are very good even a couple of days old. Enjoy!!! On week-ends, I will indulge with yummy French bread and croissants. And of course I did just that this past week-end. Unfortunately I was so busy that I did not have time to have breakfast on Sunday so there was a lot of bread leftover by Monday. I don’t like to waste food, so I decided to use this bread for a yummy breakfast casserole that I knew my Theodor would eat;-). 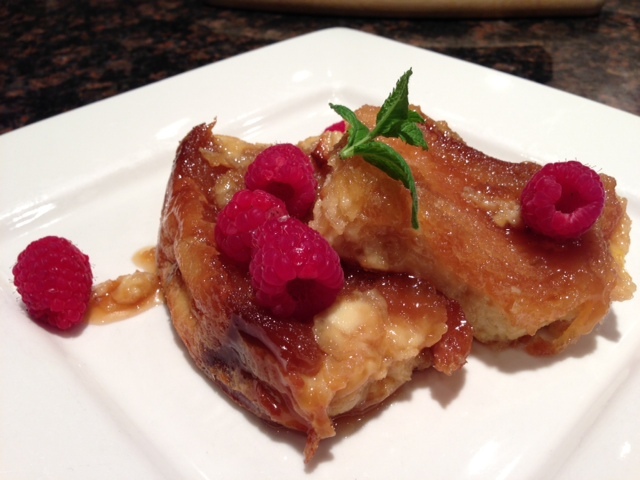 This recipe was presented to me by one of my customer, but I tweaked it a bit. 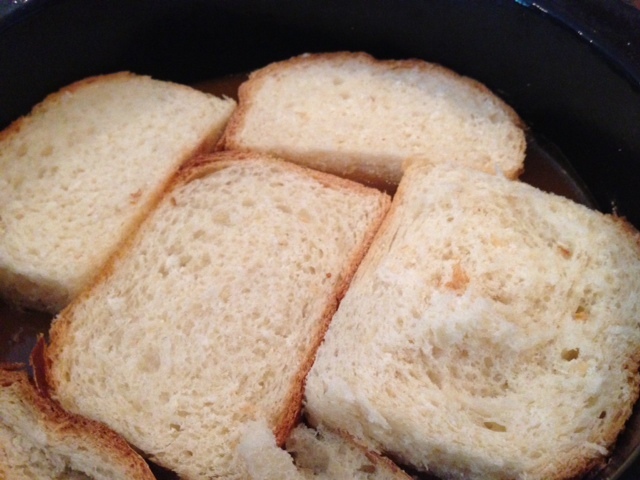 You may use french bread, or brioche, or even challah, but white bread loaf works the best. It is not too soft, and not to hard so it absorbs the egg mixture really well. First you will want to make the caramel. 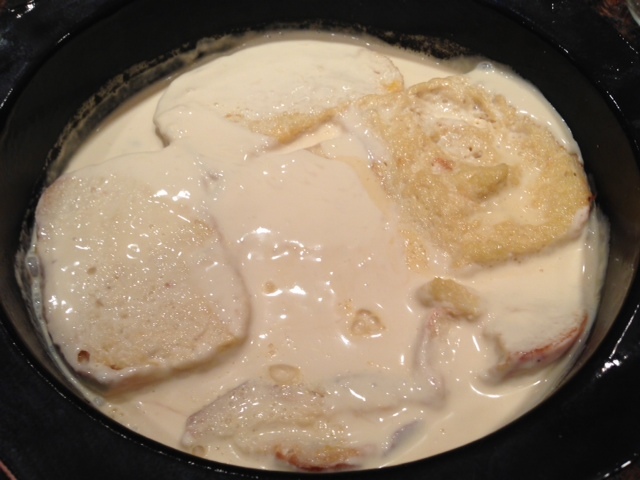 In a large saucepan, melt the butter and add the brown sugar and corn syrup. Stir until the sugar is dissolving and the mixture is bubbling. Pour this mixture into the large mold. Lay the bread over the caramel, and set aside. In a large bowl, mix the eggs, the half and half, the vanilla extract, the orange extract, the salt. Pour this mixture over the bread, and place this mold into the fridge to rest for several hours, at least 8 hours or overnight. Preheat the oven to 350 and when the oven has reached the temperature, place the mold and cook the casserole for 20-25 minutes or until it is fluffy and a little brown. After taking it out of the oven, let it rest a while so that it will not be so hot. 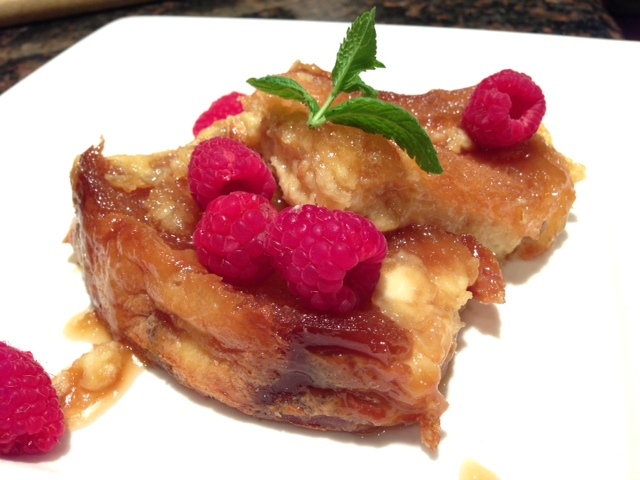 Serve the French toast on individual plates Add a few fresh fruit on top of the French toast, and drizzle some of the caramel off the casserole. Et voila!!! I don’t know how people eat out everyday. Do they just pick up food and eat at home or they just eat out? I must be disorganized or something because I can’t seem to find the time to go out for dinner, do all that needs to be done at the house and have the kids do homework. As a result, I find it easier to pick up things at the grocery store and prepare my dinner while the kids are studying or are doing what is expected of them. This evening I was in the mood for spring roll. They do require a bit of patience and a bit of organization but they are quite easy to make. There are a few rules, however, that you should follow and this will provide you with success and not frustration;-). 1. Have all the ingredients chopped and sliced in small bowls around your working place. 2. Only soak 1 rice paper sheet at a time, or it will get too wet, too soggy and will rip. 3. Lay a wet paper towel on your working area so that the rice paper will not stick to the surface of your working area. 1 / 2 of English cucumber cut in very thin slices. 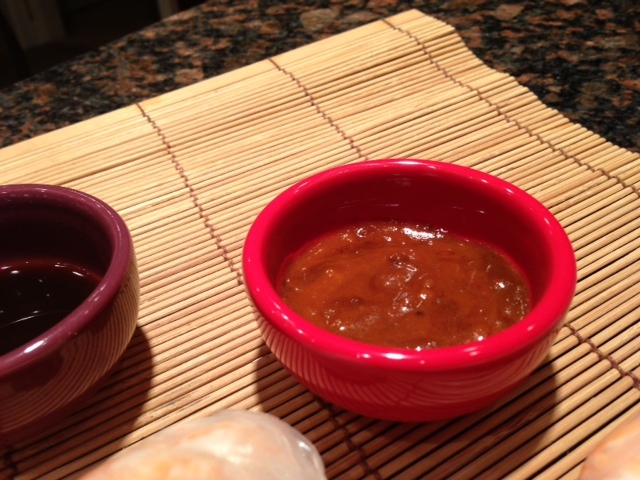 In a small saucepan, warm up the oil and add the curry. Cook the curry until it is starting to become fragrant. Add the peanut butter and cook until it is becoming a darker color. 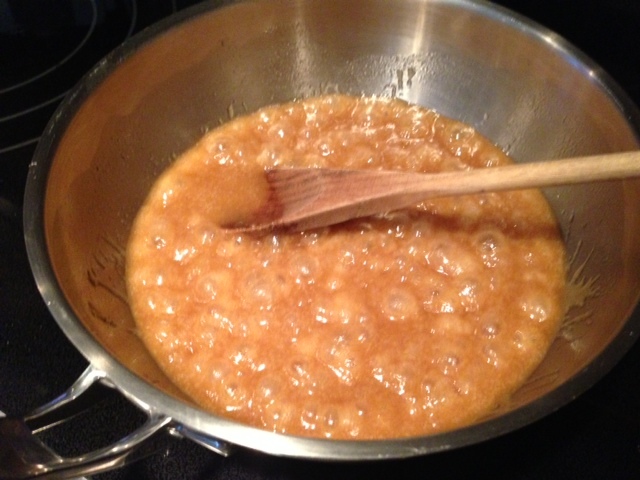 Then add the sugar and stir until it is caramelized. Add the coconut milk, broth, lime juice, hoisin sauce, fish sauce and mix well. Cook on medium temperature for about 20 minutes or until the mixture has reduced to half. Remove the sauce from the stove and add the basil. Et voila! 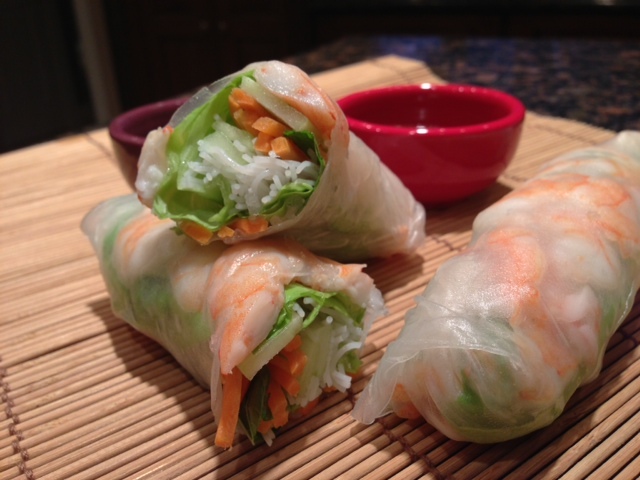 While the sauce is cooking, get ready to make the spring rolls. Pour some water in a small pot, add some salt, and bring to boil. 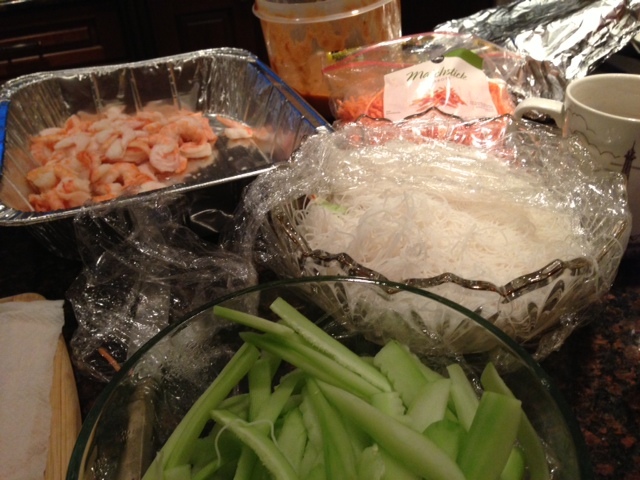 When the water is boiling, add the rice noodles and cook for a few minutes or until they are pliable. When they are cooked, scoop them out with the colander and run some water over them so that they will not stick. Drain the water, transfer them to a bowl and set them aside. Prepare the rest of your ingredients and place them into bowls around your working area. Whenever you are all ready. Place a soup plate near your working area, and add some lukewarm water. Also place a wet paper towel over your working area. 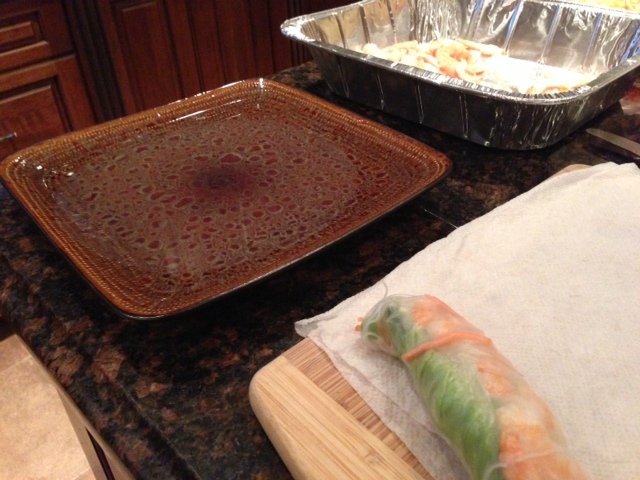 Place a rice paper into the plate and let it soak for a few seconds until it is soft. 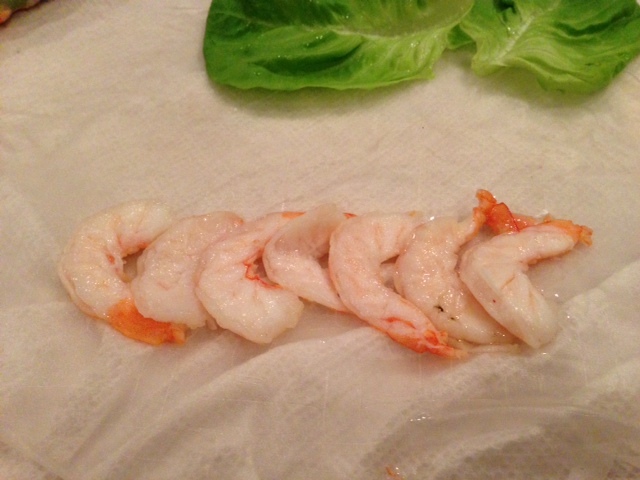 Lay the rice paper onto the wet towel, and lay 6 shrimps halves. Cover the shrimp with one boston lettuce and fill the boston lettuce with cucumber, carrots, more shrimps, mint and rice noodles. 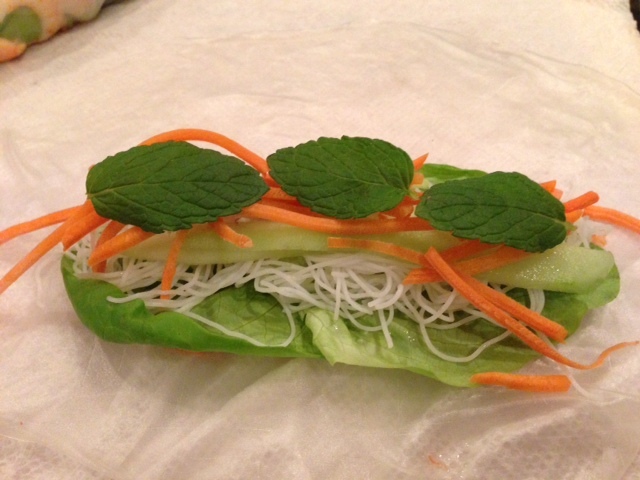 Fold the boston lettuce onto itself ( it should not be thicker than 1 inch), fold the rice noodle onto the lettuce and roll it. 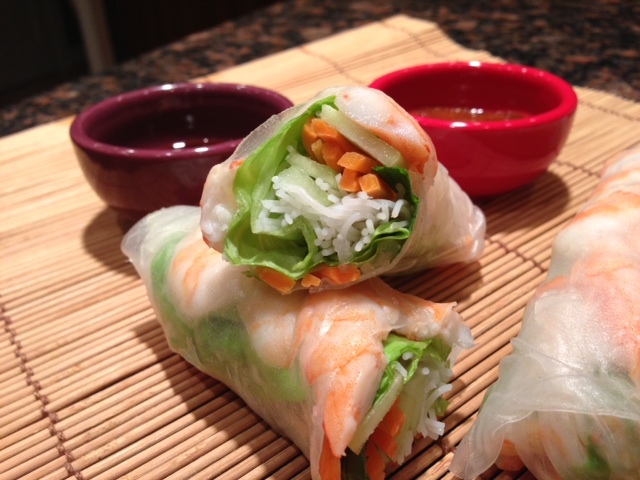 Fold the sides and continue rolling and should have a tube like spring roll. Remove the spring roll from your working area, place it onto a tray that has also been covered with a wet paper towel. Repeat this process until you have used all rice paper.